One of the very earliest projects that OTW undertook was to record the histories of as many British tethered car tracks as possible. 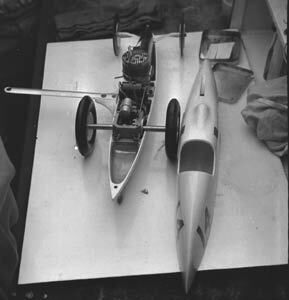 Following the very first meeting on the factory rooftop in 1943 and the end of the second war two years later, there was a veritable explosion of car clubs and model engineering societies with car sections. With each of these came the desire and need for somewhere to run the cars. In the first instance, many of these were indoors, in garages, work’s canteens, halls and the like. The aptly named Pioneer Club, being the first, used to run in the Royal Horticultural Hall in Westminster, imagine getting permission to do that now? Although Gerry Buck was achieving phenomenal speeds on just 13ft of line the creation of full sized seventy-foot dia tracks soon followed, eventually over twenty around the country. Like with most of our other projects, we try to have the articles and records linked to existing photos, memorabilia and personal reminiscences, even to the extent of intending to visit sites of long gone tracks wherever possible. In all this we failed almost completely as the information just did not materialize. Over the years though, some material has trickled in so that we can now put together what we do have, along with what we have gleaned along the way, including the few locations it has been possible to ascertain. John Oliver was one of the founder members of the Nottingham Club in April 48, along with George Brough of motorcycle fame as President. 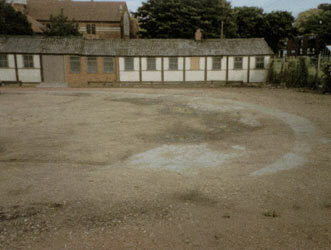 Initially the club ran on an indoor track before the creation of the full sized, 70 ft diameter track at Bassingfield. Built on farmland to the south of Tollerton airfield and adjoining Bassingfield Lane at Gamston, just to the east of the City on the A52. This was one of the later tracks to be laid down as it was not finished until 1951. The tethered car movement had, by this time, become totally dominated by out-right speed and the track hosted virtually all of the top competitors of the period. Oliver cars and engines were being built nearby in Nottingham and the 1.5cc and 2.5cc Tiger engine units were almost universal in the smallest two classes. Very few tracks were still in operation at this time and so national and regional competitions held there would see the very fastest cars in action. 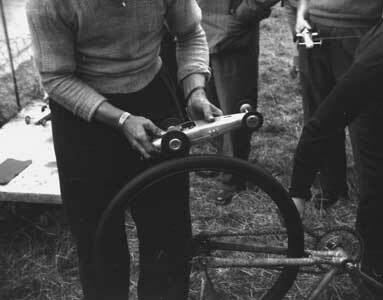 Sometime during late 1953 or early in 54 Roger Alton, who lived nearby in West Bridgford, visited the track with his Contax camera and recorded the images reproduced below. Unfortunately the specialist magazines had all ended publication by 1952 and so it has been impossible to identify all the individuals or cars pictured. However these represent an excellent example of track activities and methods of operating cars at that time. that grow significantly at speed. Background, top from teardrop car. 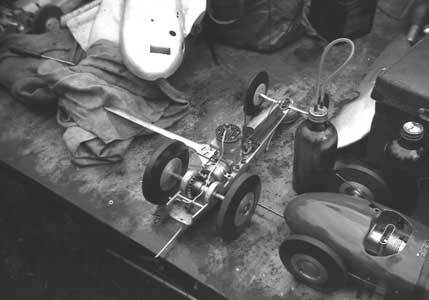 Jack Parker's ETA powered cars with the now universal 'pan handles' rather than wire bridles. Both cars rigged to run 'wrong way round'. Push stick and external glow battery on bench. Fitted case behind. Dooling motor. European record holder at 194 kph. 'Moore Special'. Sadly, the box was destroyed quite recently. the motor for testing. This method of starting is still used. External glow battery attached by cable, push stick ready. 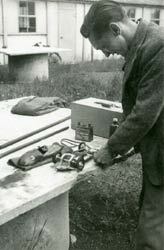 Jack Parker of the Meteor Club prepares to 'push off'. 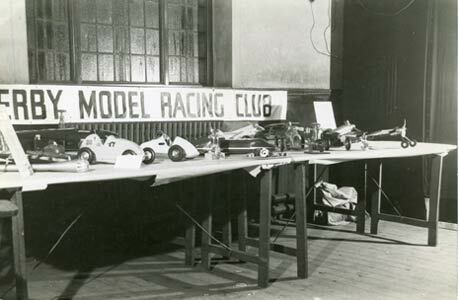 The Sunderland Model Car Club was inaugurated early in 1948 by Capt Hindmarsh and some friends. Initially they ran cars in the premises of Young’s Motors, Hindmarsh’s company, situated along Roker Avenue. 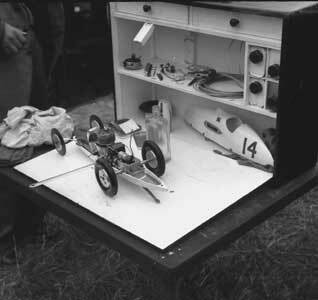 There was also the North East Model Car Club that ran cars in the premises of Westools. It is assumed that at some stage these two clubs combined. We are lucky that Sunderland is the only British track where full details of the origins, planning, design, tendering, construction and costings were published. It is also one of only two tracks in this country that we know of where evidence of their existence still remains on the ground. The Club was unable to realise their original plans to add a track to the hydro and model railway facilities already established in Roker Park Sunderland by concerns about noise. After a great deal of negotiation, a site was eventually found in Barley Mow Park off the Ryhope Road that would allow for a full sized track. Following extensive planning and a decision to contract out the work the go-ahead was received on the 23rd June, cement was being poured on the 30th and cars running on Saturday the 2nd July, an amazing record. The track was situated in front of the Civil Defence buildings, whilst the pits seemed to be comprised of boards laid on sewer pipes. The track hosted many national and area championships and was home to two of the most successful British Competitors, Ken Proctor and Jack Cook who won four European Championships between them in the 1950s. 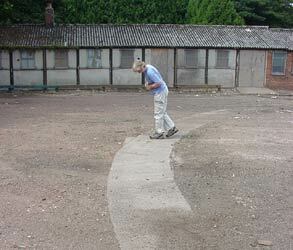 The site and huts that later served as a children’s nursery are now derelict, but much of the track is still visible on the ground and can be clearly seen on satellite photos. The track and buildings were both in a very sorry state when we visited. 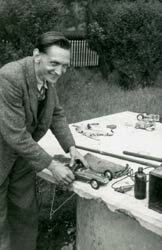 A very full description of the entire planning and construction of the track was published in Model Cars in September 1950. 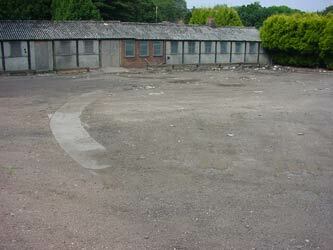 Formed on January 1st 1948 with a 70ft track between Raynsway and Derby Road. The track was lost in 1951 to a road widening scheme. 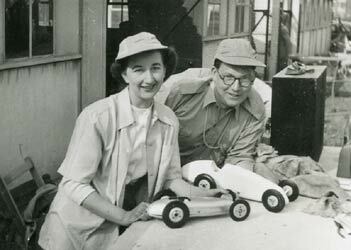 Derby was the home club of Ian Moore who served as secretary for a while and his wife Ivy, a renowned competitor in her own right. Ian and Ivy Moore. Bolton Society 17th July 48 70ft track at Leverhulme Park, Darcey Lever. Track also used by Altrincham Club. Birmingham MCC. Track at Pinly, Clavesdon. Amalgamated with Worcester Club in 1952, taking over G.I. Hastings’ private track at Ambrose farm, St James’ Worcester. 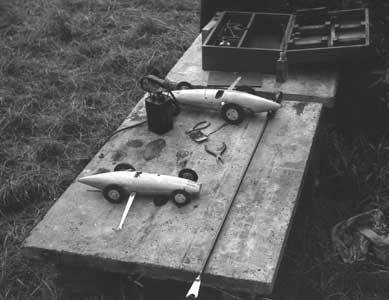 Chiltern Model Car Club Opened track at Woodside Farm, Slip End Village, Caddington Common Luton on Easter Monday 1949. 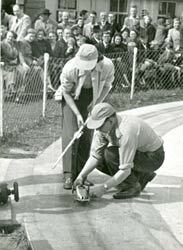 Only British track to host a European Championship 1954. Edmonton Club. Track behind Cart Overthrown Pub on Picketts Lock Lane Edmonton. Guiseley Track off Moor Lane heading out of Guiseley. Leicester Mini Car Club. 48 Batchelor and Bowles garage and Staughton aerodrome. Bob Gerard. Meteor Club. Rist's Cables canteen. 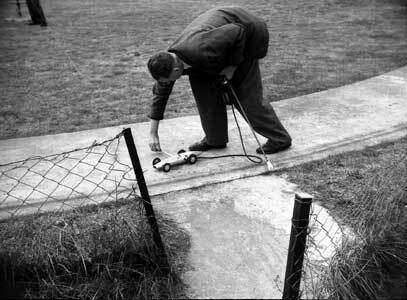 North Wilts 1948, Private track at Steels Garage Swindon subsidence problems. 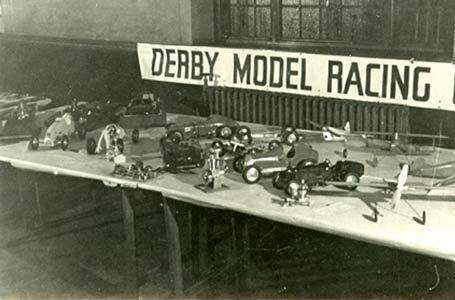 Ossett and District Miniature Car Club. Opened in June 49 by Speedway star, Eric Langton.